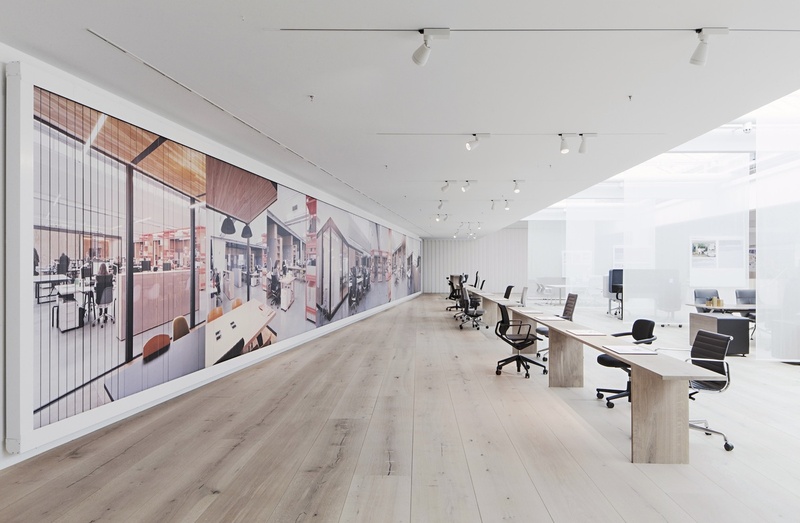 The Vitra Workspace houses a comprehensive overview of Vitra's furniture for offices and public spaces, and is a dynamic planning and learning tool for these environments. The space occupies the second floor of a factory building designed by Frank Gehry in 1989, which is located between the Vitra Design Museum, a factory, the VitraHaus and the Citizen Office. In location and in concept the Workspace is a nexus that connects intellectual ideas about design with practical office solutions, and the informality of the home and public sphere with the demands of the office. Several installations, including a revolving billboard of life-size photos of Vitra-furnished offices shot by Daniele Ansidei, a factory view with a scrolling LED text that explains the processes on view, two seating bars, a reference library and a materials library, provoke curiosity and a deeper understanding of issues of the contemporary office and of Vitra's unique culture. The space was designed in collaboration with the London based architect Pernilla Ohstedt and graphic designer Harsh Patel.